Until 2014, the only women bloggers I knew, Jessica Jones of How About Orange (She has quit blogging at How About Orange) and Gina Trapani of Lifehacker. As per now, thanks to IndiBlogger, WordPress, and other wonderful blogging communities, I learned about some of the fantastic women bloggers, especially from my homeland, India itself. In contrast to generalizations, Indian women blogosphere is not about masala, chutney and fashion tips at all. In reality, it is about dreams, liberation and a new conscious voice. They ink opinions. They write reviews. They pen memoirs. They craft beautiful poetry, short stories, and haikus. And much more than that, they are influencing the way you and I think. They are somehow changing us and changing us for better. So just to salute them, here I have tried to compile a list of 40+ Blogs by Super Indian Women Bloggers. In actuality, I am not overstating if I say I have learned a lot about blogging from this specific blog, Scribble and Scrawl and its blogger, Somali K. Chakrabarti. Somali writes very mindful posts on leadership, productivity, self-improvement, and social awareness. Besides that, she also writes about art and culture of India. Her last blog post Braveheart is a beautiful haiku, and about believing in yourself, even when things are not the way you want. Searching for some exotic food for your thoughts. If yes, then you definitely need a dose of Happiness and Food by Parul Thakur. An HR by career, a Wikipedian and Blogger by passion, and an Optimist by choice, Parul is bold and clear in her writing, and her articles surely make you think twice. Her last blog on The Right to Abortion is one of many such reads. Haathi Time is a tale of a Bangalore girl (and now, a Goan girl), Revati Upadhya. When you read her stories, you will find an instant connection with her and her writing. It feels good to read something that makes absolute no sense, and somehow, all the sense. In her last blog post, Let’s begin with peace, she showed how to announce your birthday to the world in style. Travel Tales from India is one of the first blogs, I have discovered through IndiBlogger. Managed by Mridula Dwivedi, it is more than a travel tip blog. Travel Tales is about experience and joy ride. It is about being free and live your life to fullest. Mridula’s last post is The Night Market at Chiang Mai, Thailand. The blog features interviews and success stories of women entrepreneurs and women who are changing the face of this country. Lakshmi Rebecca is one of the first generation Indian Vloggers and known for her vlog, Chai With Lakshmi, where she discusses women related personal and societal issues. Recently, her vlog Chai With Lakshmi has crossed 30 million view mark. The Lit Room is a blog about theater, literature and stark opinions. The blog is managed by two Art students, Amrita Rao and Nitya Andrew. The only thing I can say about their blog, just go and read. And in case you want to know why, the latest post by Nitya, Feminism in the time of Fashion, will fully satisfy all your queries. What about some crossword puzzles, and some words, and some jagrons and everything else, i.e. food for your brain. If yes, Crossword Unclued by Suchismita Upadhyay is a blog for you. Read her latest post, Contronyms, if you want to know what that means. In any case, if you are looking for some advice on personal and professional development, then Lata Subhramanian’s blog is for you. Lata ji shares tips on personal and professional life through her blog, Lata Wonders. Her latest post Tummy, Yummy, Mummy is one such good read. Parwati Singari’s blog is in the same line with Lata Subhramaniam’s blog. Like Lata ji, Parwati drafts some beautiful articles and stories that are connected in some or other way to us. Her last blog post Laundry and Life Lessons is one such beautiful piece. Sunshine and Zephyr is one of the delightful reads on the internet. Shewta Dave, the face behind this blog, weaves words in such delightful manner that it makes you think twice without making you feel awkward about it. She also writes in Hindi. So, if you like to read blogs in Hindi, then there is one more reason for you to follow her blog. And Her last post Wary is one such beautiful embroidery of the words. Eat Travel Live by Divyakshi Gupta is about good food, long trips, and awesome life, ultimately about the celebration of life. Her latest post, Streets of Punjab is evident of her blog theme. 10 Year Itch is my first follow-wala travel blog. Madhu and Savi, the faces behind this popular travel blog, write some very insightful posts on known and not so known travel destinations in India. Their last post Plakkad, will tell you why I love their blog. If you love to read Haiku and short stories, then Scattered Thoughts by Maniparna Sengupta Majumdar is a blog for you. Maniparna shares beautifully crafted haikus, poems, and short stories on things that matter to you and me in some or other way. Her last post, Changes (The Family Portrait #1) By Gillian Felix is also a book review. If you think, in the country of 3 million+ IT professionals, there is no IT girl who blogs, you are completely wrong. Here is our IT Girl AKA Indian Screw Up AKA Ritika. With her blog Indian Screw Up, Ritika defines every emotion that every IT person goes with, or every aspirational class girl or boy deal with. Her last post I am feeling 22, beautifully explores the feeling of any IT professional, who just want to escape into some other world, but what this IT sector never let them do. 16. Life is a Vacation. What do you think about life, Life is hard, Life is a struggle or Life is a really long Vacation, just to enjoy the moments while your stay on this planet Earth. I believe in the latter one, so does the Sangeeta Das, the face behind this beautiful blog. Her last blog is Reminiscing my days in Nepal. I am just pretty jealous of this girl i.e. the girl behind this blog, Renuka. The Girl has penned a book (though not published), worked at Archies Greeting Card Company (actually this is one of my dreams, to work in a greeting card company with perk of 1000+ greeting cards beside salary, so I can send a greeting card to anyone I know or not, just to capture those smile). And most importantly, she is a solo traveler. Read her lastest blog post on Voyager For Life about basic travel related thing one solo traveler should know. It was in the last summer when I discovered Namrata Kumari’s A Lexical Tapestry. And after reading my first story of hers, Guilt (Read Guilt to know talented she is), I just became the huge fan of hers. And from then, I regularly visit her blog, and every time I visit, she surprises me in some way. Her last blog post is a haiku, Dusk and is about the beauty of life under the shades of golden dusk. Soulful by Roohi Bhatnagar is another good blog read. And in any case, you are searching for another IT Girl in this list, she is the one. Like Ritika of India Screw Up, she is also an IT Pro. If you think that I am biased toward fashion blogs. I assure you, I am not, actually I am not a fashion fanatic and there are very few fashion blogs, that I follow. Though, this blog and girl captured my imagination with minimal design and everything tip-top. The Girl behind this blog, Debiparna Chakraborty, surely knows how to make a great fashion blog. The blog features product reviews, look book photo shoots, and women related issue articles. Read her last blog, though not fashion post, but an interesting read, Women in Leadership. For the sake of readability, and length of the post, I have divided this post into two parts. So if you are searching, other blogs in the list, here is your link to the second part. The order does not resemble any ranking, so If you believe this is some ranking, then you are completely wrong. I believe every blogger has her (or his) own unique style, and it develops with the time. So, you can’t judge one style with other. All pictures are used in good faith, just to spread awareness about these blogs, so in any case, you have problem with use of picture, you can contact me. 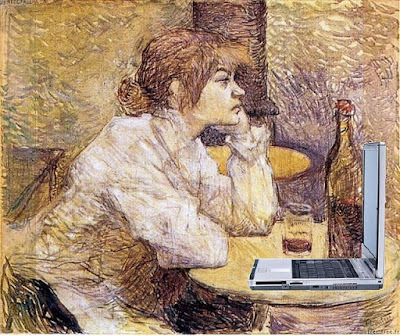 The first one is photoshopped version of Portrait de Suzanne Valadon par Henri de Toulouse-Lautrec (circa. 1888) by Notions Capital.